Although the opera ‘The Thieving Magpie’ by Rossini is rarely performed, the overture remains a great favourite, written in a single day according to legend, and featuring military side drums—rarely found in the orchestra of 1817— the year of its creation. Fourteen years earlier Beethoven was soloist in his own Piano Concerto No. 3. His first two concertos were more in the style of Haydn and Mozart, an extension of chamber music perhaps. His third is the first concerto to vie with symphonies in weight and length, and signals the start of a long string of virtuoso works by Beethoven and others, including Brahms, Grieg and Tchaikovsky. The Ukrainian pianist, Dinara Klinton, will recreate this key moment of musical history for the CCSO audience. She is the recipient of the prestigious Benjamin Britten Fellowship and has won a number of other international awards as well. Premiered in 1935, William Walton’s Symphony No. 1 was a sensation. The composer received a five-minute personal ovation, and the work has been highly thought of ever since. Resembling the style of Sibelius to some extent, it also offers reminders that Walton was the composer of Façade and Crown Imperial. 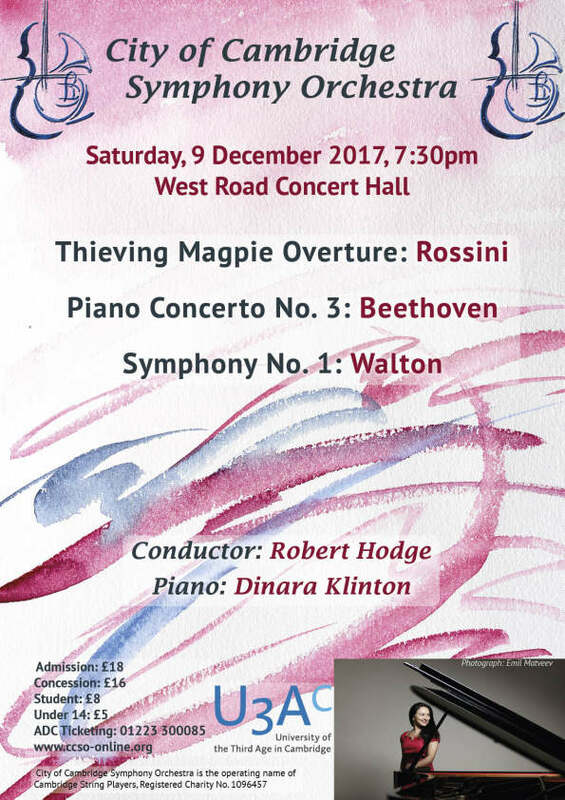 The critic Michael Steinberg wrote, ‘… the claim that (Walton’s) First Symphony is one of the great twentieth-century symphonies is not excessive.’ Clearly, this programme should rank high on the list of ‘must hear’ concerts.